True to form, the clock strikes the month of October and I’m on the couch with a sniffling cold. Classic. Feeling sorry for myself and with a VIP ticket to the self-pity party, I sat staring at my phone googling things to help boost my immune system, to try and shake this cold! A few lovely friends offered up wise words of advice over on Instagram, with natural remedies to try, so I set to work. 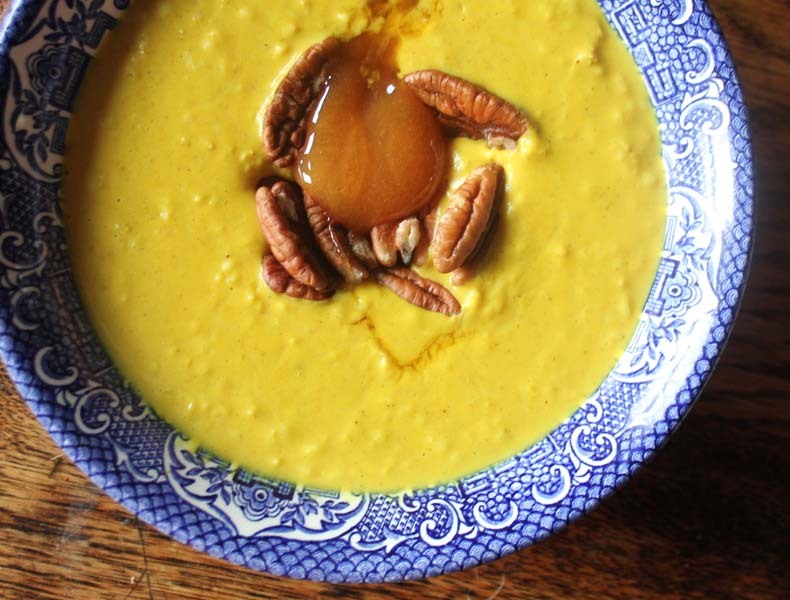 My quest resulted in the creation of this (very tasty) Golden Tumeric Porridge Recipe. First up, Manuka honey. I dragged my sorry self out to Holland & Barret dodging the crowds in pursuit of a jar of Manuka Honey, a pricey affair but my good friend swears by it- so worth a try! Another suggestion was to add turmeric to my porridge. 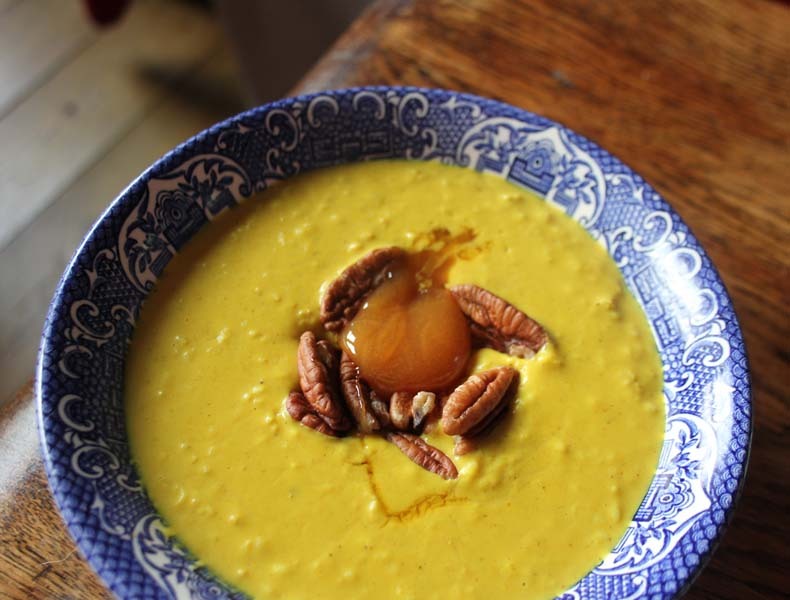 I’ve discussed briefly the benefits of turmeric in my pervious Golden Milk Recipe post, so thought this sounded like a great idea! Promote Oral Health- Studies have shown Manuka honey attacks harmful oral bacteria associated with plaque formation, gum inflammation and tooth decay. Soothe a Sore Throat- Not only does Manuka honey attack harmful bacteria, it also coats the inner lining of the throat for a soothing effect. Make your porridge as usual with the oats and almond milk boiling in the pan. Stir in your tumeric, nutmeg, ginger, cinnamon. 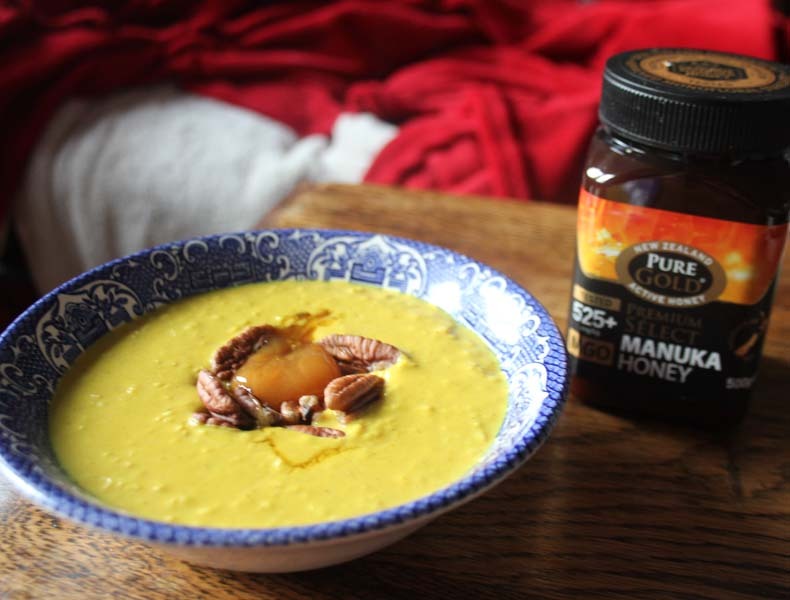 Put your porridge in your bowl, top with a handful of pecans and dollop of Manuka honey. Voila!